It was back in October 2008 when I first discovered that I had cancer. I felt a tumor on my chest bone, so I went to the hospital for a check-up. I was very nervous and scared at the time. I am very health-conscious and regularly exercised. I also took health supplements, so I didn’t think I would get cancer. The doctor did a biopsy on me, and the laboratory test confirmed that it was breast cancer. He found three tumors — the biggest tumour was about 1 cm in size and it was in stage 3. Later, my husband and I consulted other doctors for a second opinion. I went to Singapore for a check-up as well. The doctor there gave us the same answer. I returned to Johor Bahru for surgery to remove the tumor along with the surrounding lymph nodes. After the surgery, I felt fine so I didn’t worry. But I still ate healthfully and exercised. I tried to reduce stress at work. But in less than two years, the tumors returned! I had a whole row of small tumours. I went back to my oncologist for another check-up and he told me that my cancer had recurred. He also told me that it was impossible to undergo surgery because that part of the skin was tight and it would be very difficult for it to heal, therefore he suggested electrotherapy instead. In January 2011, I started electrotherapy. While undergoing it, I came to know about the Chinese Herbal Complex Composition Tian Xian Liquid. I started to drink Tian Xian Liquid during the treatment. At that time, I was also suffering from pleural effusion and I had 2 litres of fluid pumped out from my lungs at the hospital. The doctor discovered that the tumor had spread to the bone. I started chemotherapy for this reason. Around July 2011, I completed all treatment procedures of Western medicine, which included electrotherapy 25 times. The main cause of my breast cancer was the estrogen that caused the cancer cells to be very active. In order to reduce the estrogen level in my body, the doctor suggested removing both the ovaries and uterus. That same year in August, I underwent a surgical procedure of removing both the ovaries and uterus. I had three weeks’ rest after the surgery and resumed taking Tian Xian Liquid. I could feel my body, hands and legs becoming warmer, and a rosy glow brightened my face. In addition to a good appetite, I even gained 5 kg of weight. Over the past few years of fighting cancer, my husband has been by my side taking care of me. I am really grateful to him. 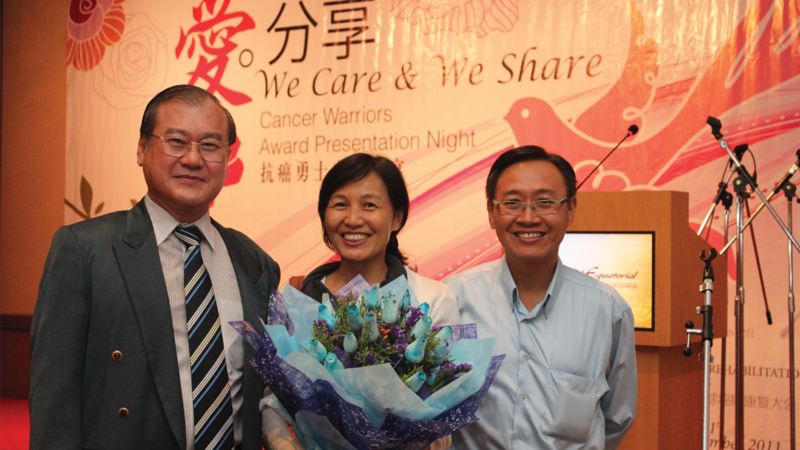 And because of cancer, I deeply felt the love and care of the people around me. When they heard that I had cancer, they all got worried and nervous. They wept but I didn’t shed a tear. The first time I was diagnosed with cancer, I wasn’t afraid because physically I didn’t feel anything. It was when the cancer recurred that I started to be afraid. I feel better now, but I still get worried or lose my confidence when I feel pain. My wife suffered from cancer recurrence due to metastasis. We did not accept electrotherapy at that time because we thought Western medicine had come to a dead end. The Western approach is to eliminate cells in the body regardless of whether they are good or bad. We thought this approach was not a good one. We chose Tian Xian Liquid, because we believed in the idea. How could we fight cancer if our immune system is weak? I encouraged my wife to consume Tian Xian Liquid as a complementary therapy. One has to take good care of one’s health, and then only can one fight cancer effectively. In addition, a medical institute in Taiwan has studied Tian Xian Liquid and has proven that it could eliminate cancer stem-like cells.This made us even more confident. Spiritual support between the husband and wife is very important in the fight against cancer. Cancer patients suffer great physical and mental trauma. If they do not rely on the support of family and friends, it would be hard for them. If one has the opportunity to participate in cancer rehabilitation-related associations, and communicate with other cancer patients who support each other, that would be a good idea too. I personally think that religion would be quite a good spiritual sustenance. It helps in recovery, too. We are Buddhists and have learned to let go of things and that’s the reason why we don’t feel too anxious. Previously when I was being diagnosed with cancer, my husband and I could not believe it at all! We had always been very health conscious. We followed a proper diet and hardly ate any fried or grilled food. We led a healthy lifestyle. Therefore when I was diagnosed with cancer, the entire family couldn’t believe it. They were shocked because they led a less healthy lifestyle than ours! However, the doctor said my cancer was caused by hormonal conditions. Excessive estrogen in the body causes the mutation of cells. Treat It Before It’s Too Late! The first time I was diagnosed with cancer, we did not take much precaution against cancer recurrence. It wasn’t until I suffered a relapse that I learned how to take good care of my body and boost my immune system in order to treat and prevent cancer effectively. We sincerely hope that you remember this principle: Treat it before it’s too late. May all cancer patients be strong and be persistent in taking good care of their health.